Over the two legs a humble if not humbled Guardiola then saw first hand this Klopp ‘way’, and also realised that there is also more than one. “They are a top team, top manager, so I would say they deserve to be in the final,” said the Catalan once his side were knocked out, and once he’d voiced his concern about the ridiculous refereeing on show during the game. After the antics of Antonio Mateu Lahoz have been forgotten, it will be back to the drawing board for the Man City manager as he starts planning how to beat Klopp next time around. Over the two legs he saw a well oiled, well drilled, and hard-working Liverpool side which are now immersed in the German’s tactics. Klopp himself has learnt a few things along the way, and has even had to adapt between the two legs of this quarter-final, using the Everton game to settle Georginio Wijnaldum into the defensive midfield role in the absence of Jordan Henderson and Emre Can. Even within the second-leg itself, he was adapting to what the opposition, whom he admitted were “the best team in the world,” threw at him, and they threw a lot in the first half. His reaction to this barrage of attacks was to move two of his most reliable tactical heads, Roberto Firmino and James Milner into different positions for varying amounts of time. After 24 minutes of City pressure Klopp decided to change things. Kevin De Bruyne watched Sadio Mane trot over to the right wing before looking to the bench for instruction from his own manager. Firmino took Mane’s place on the left and Mohamed Salah went up top. 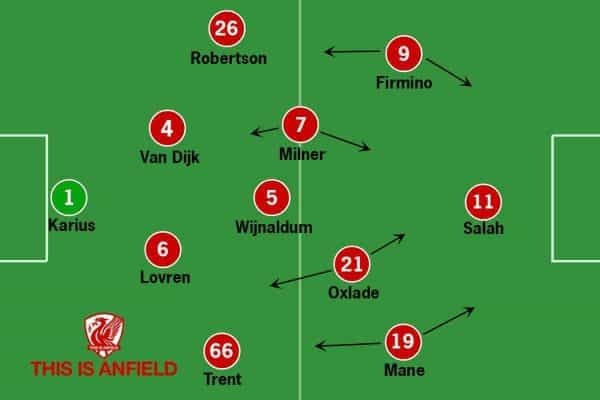 This was the formation which won the game and saw Liverpool through to the semi-finals. Just after the half-hour mark, and around five minutes after Trent Alexander-Arnold picked up a booking for a foul on Leroy Sane, Klopp moved Milner from the left of midfield to the right to support the 19-year-old. Milner provided more defensive solidity in front of the right-back who was being targeted by Sane as he was in the first leg. Trent went on to make a total of six interceptions in the game, and was only beaten by the City winger once according to his defensive dashboard below, from Stats Zone, which shows interceptions as diamonds and one-on-one duels as crosses. Klopp was changing his lines like an ice hockey coach, and Milner is definitely the most valuable member of his energy line. The No 7 stayed there until half time, giving the manager chance to fully impart these instructions in the dressing room, rather from the touchline. From then on Mane, Georginio Wijnaldum, and Alex Oxlade-Chamberlain all provided defensive support down the right flank. While a lot of the focus has been on how Guardiola’s tactics lost the two games and the tie, there should also be praise for Klopp’s tactical changes. They were noticed by a few members of the press, and he fielded a couple of questions on the subject after the game. “We [changed] in the first half, we only explained it a little bit better [at half time]. “Mo needed to come in the game a little bit, and so we made the change in the first half. “The problem was not Mo. We felt so much under pressure, the first contact already we send him in the next race, it makes not too much sense. If we play one against two constantly it’s not cool. “The boys found a solution and we had two or three moments in the first half already, and the best one in the last minute of the first half. 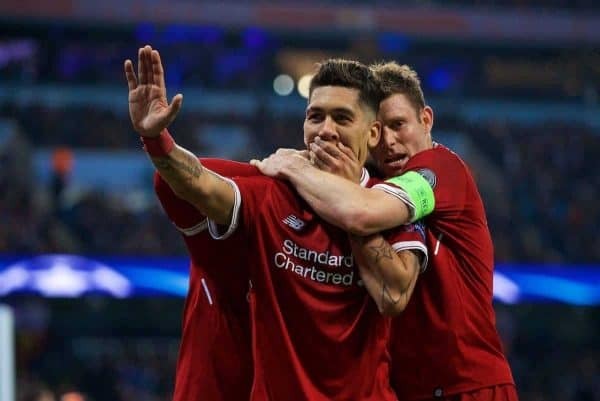 Firmino’s role as the defensive winger was key, and he scored a goal straight from his own press on Nicolas Otamendi which sums up Klopp’s Liverpool and the man who drives it from the front. The second time he was asked a question related to these changes, Klopp went into more detail on how they affected the team’s shape, their ability to retain possession for a little longer, and be more dangerous on the counter-press. “I knew we have to change a little bit from the first half. “We have to be more compact and then because of that [we were] winning more second balls, then playing more and better football in the moments where we get the ball. 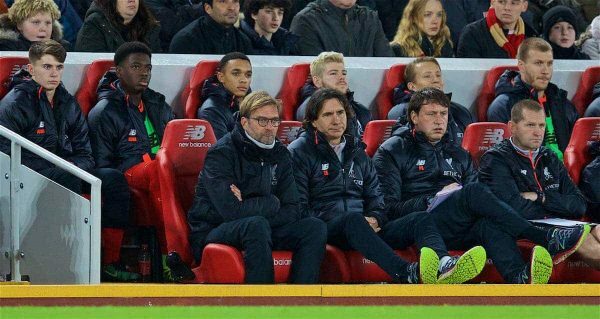 Klopp’s style is often perceived to be the result of nothing more than sheer work rate and desire, but there is much more to it. 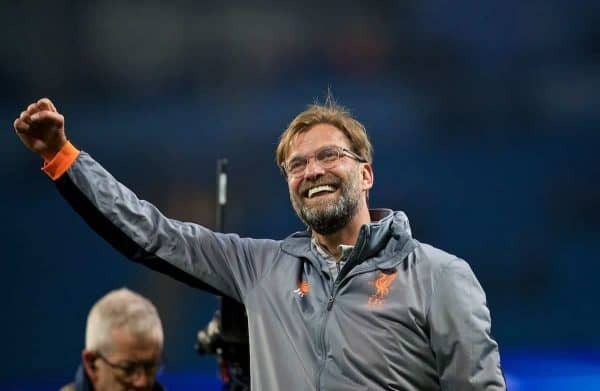 Maybe it’s because he appears passionate on the touchline, and less of a thinker, but he is constantly analysing the game along with his assistants Zeljko Buvac and Peter Krawietz. The work rate is required to carry out such a plan, of course, but it also relies on discipline, intelligence, positioning, and the ability of players to react appropriately to things they might not be used to in training — traits which are often associated with Guardiola. What is juego de posición in German? Klopp spoke of this added compactness and more disciplined positioning in his post-match press conference (see above) where he also made a comment similar to one he made in May 2013 when his Borussia Dortmund side were due to face Bayern Munich in the Champions League final. 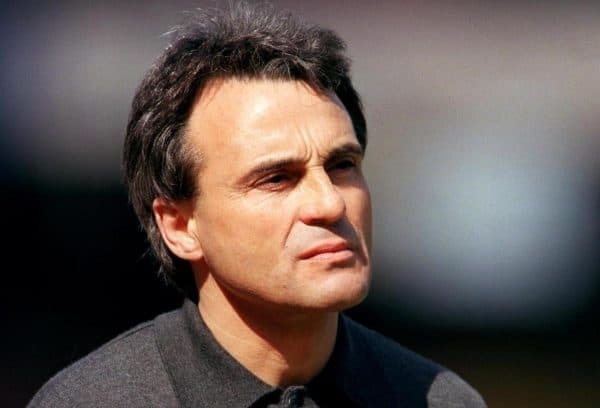 Back then he spoke of his two football mentors: the direct influence of Wolfgang Frank at Mainz, and the indirect influence of Arrigo Sacchi via Frank’s teachings. “I’ve never met Sacchi, but I learned everything I am as a coach from him and my former coach [Wolfgang Frank], who took it from Sacchi. “Even though we were in the second division we were the first German team to play 4-4-2 without a libero. “We watched this very boring video, 500 times, of Sacchi doing defensive drills, using sticks and without the ball, with Maldini, Baresi and Albertini. Compare this to his words after last night’s game, and the ideas are the same. “I really think [Man City] are the best team in the world at the moment, that’s how it is, but I knew we could beat them. Klopp tactically outwitted Guardiola. The intense work rate and counter-pressing associated with Klopp are just parts of the plan, not the whole plan or the only plan. Firmino as a defensive winger, Wijnaldum kicking things off for the opening goal with his directness from his new position, Milner seeing the cautioned Trent through the final minutes of the first half, the compactness, the positioning, and the counter-pressing: none of this happens though hard work only.